Everyone knows gardeners are generous people; they’re at the ready with the shovel or snips to share a seedling or cutting. Knowing this I guess I shouldn’t be surprised that they are also willing to dig up, package, trek to the post office and pay the postage to send off a desired plant to a far-away gardener. I shouldn’t be surprised but I am. Its one thing to hand a plant to a visitor standing in your garden, but it’s another to send one to someone you’ve never met. Or maybe not. Maybe that’s part of the power of the internet, and blogging. We do feel like we know each other and want to share the spoils. 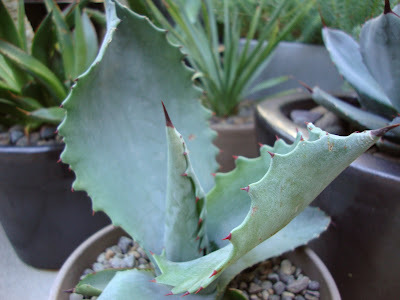 For example in July when I posted pictures of an unknown agave I purchased and thought might be Agave ‘Mr. Ripple’, Denise of A Growing Obsession sent me this pup from her Mr. Ripple for comparison. How nice was that? (and in case you are wondering mine was not A. ‘Mr Ripple). The latest gift to arrive at my door is an Agave potatorum pup from Reuben, of the blog Rancho Reubidoux. His A. potatorum is throwing up an amazing bloom spike (and it’s planted in a container! see it for yourself here), rather than enjoy the pups himself he decided to give them away. The other one is destined for the slightly more agave friendly lands of San Francisco and the amazing succulent garden of Megan and Matti of Far Out Flora. But have no fear; this one will be very well loved and cared for here in Portland. Since I didn’t have the perfect container on hand to plant it up I used a trick my brother taught me for preserving pups, and wrapped the base in a moist towel. 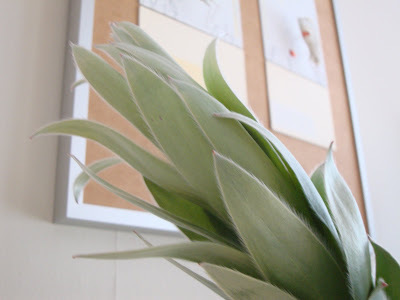 Then I realized how much it looked like a perfect spiky flower, and voila! It joined the tableau on my mantle. It’s a silver grayish blue plant palette…started just the day before when I walked into the market to grab a bottle of wine, and instead found myself side-tracked by the most amazing branches in the floral department. 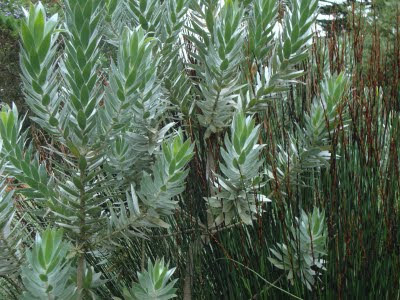 They had to be Leucadendron argenteum or Silver Tree, no I couldn’t remember that name at the time, I’m not that smart. I just knew it was the amazing tree (from the Protea family) that we saw in the San Francisco Botanical Garden last October. I bought all three of them! Extravagant maybe, but at $2 each an affordable extravagance, and I just bought a cheaper bottle of wine to make up for it! gorgeous - lucky you. PS - love the mantle. Just beautiful and so creative. I never would of that to put that on a mantle. You are quickly becoming the go-to gal for agave info. Just think of these generous gifts as offerings to the goddess. Right choice in my book, unless you have a more sophisticated palate than I do when it comes to wine. I'm not surprised that people are so willing to share with you. I've gotten so much out of reading Danger Garden. You've definitely helped me improve my garden and quadruple my plant wish-list. I think you're right about gardeners being generous folk. Maybe it goes along with the urge to grow things, or maybe it's just a selfish desire to see cool plants spread far and wide. Love the silvery foliage and the generosity of gardeners! I actually saw the first agave in clumps at my local target for 5.99, but I held off since they're labeled only as "landscape succulent" and I had no idea of how hardy they were. Now that I saw your container idea I might have to get them when they hit clearance! Lucky you, two very cute pups! My leucadendron is just budding up. I know it's not argenteum but didn't keep the tag. Such beautiful shrubs. Sharing plants is generous, yes, but has a practical side. If we lose the mother plant, we know on whose door to knock! Love the vignette , and that vase with the A. potatorum looks suspiciously Bauer-like. I fear plants aren't the only things I collect. How can one make room for all of it ? It does look like a silvery gray flower in a vase. How nice of people to share their plant babies with you. Denise and Reuben are generous (and typical) gardeners. 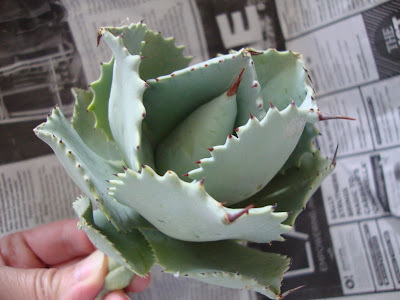 Since I've been the recipient of your generosity, agave-wise, I can attest that it's the natural result of your gardening kharma. 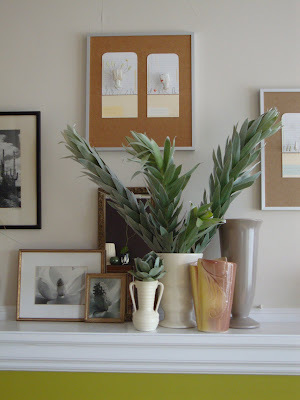 And you know how to make the right choices - that's a beautiful tableaux on your mantel. LOVE it when that happens! And like everyone else, I'm incredibly struck by your mantle design. Lovely! PVH, thank you! You made my day reading your comment. I hope someday that my other venture (plant lust) can help you find those plants on your wish-list! RFG, do it! (they are not hardy here...but that has never stopped me). Megan, quality time with a grevillea sounds perfect! ks, space is always an issue isn't it? That case is from my thrift store years. I have so many (too many?) picked up for a song. Grace, I'm glad you see it too. MulchMaid, thank you. I love changing up the mantle every chance I get. I fear I've showed it too often here (oh god...here she goes again...another mantle picture)...but I could make an entire blog out of it! 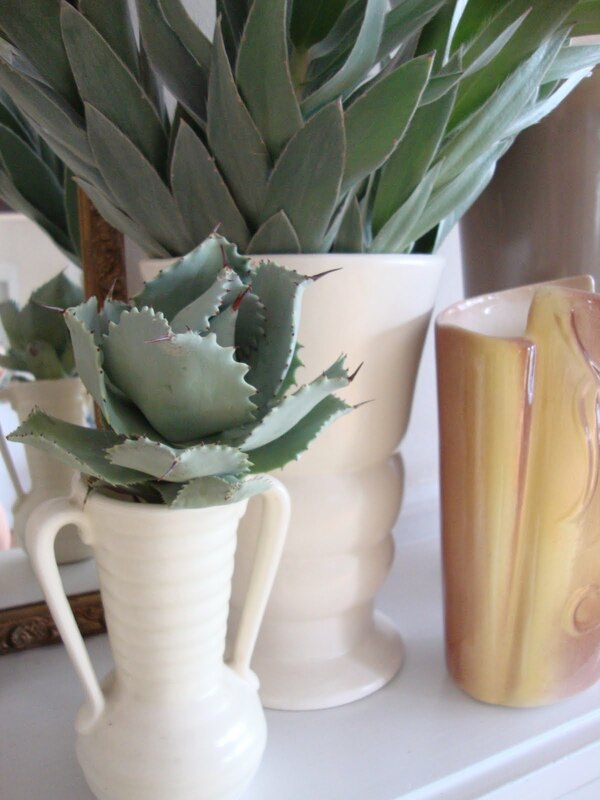 Hey, Loree, love the pup in the urn... the creamy glaze is so nice against the blue/green!